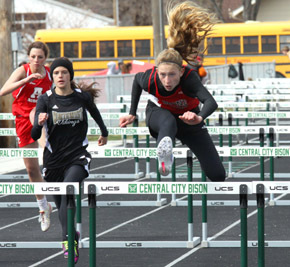 Despite another unseasonably chilly day, athletes from six schools competed Monday in the Central City Invitational, which had been postponed by last week’s snow and ice. The Boone Central/Newman Grove Cardinals did an excellent job shrugging off Monday’s chill and scored solid team finishes as a number of athletes posted early-season bests. The BC/NG boys engaged in a three-team battle with Aurora and G.I. Northwest. The Cards finished third, but were just seven points off Aurora’s winning total. No team had an answer for Northwest in the girls division, as the Vikings ran away with the team title. The Lady Cardinals edged Aurora for runner-up honors. One of the meet highlights for the Cards was a sweep of the 3200 meter runs. Boone Central freshman Hannah Schmitz registered a season and Albion News area best time of 12:42.6 to win the girls race and moments later sophomore Andrew Rasmussen captured the boys event in 11:01.4, also a season and area best. Nick Paulson added a win in the 110 meter high hurdles with a 15.8 clocking and Derek Gentrup scored Boone Central/Newman Grove’s other event victory in the boys competition, topping 5’10 in the high jump. BC/NG had six additional season and News area best performances Monday by Travis Kennedy (200, 3rd, 23.7), Paulson (300 hurdles, 4th, 43.1), Matt Brugger (800, 3rd, 2:09.1; pole vault, 2nd, 11’6), Trevor Salber (1600, 5:05.5) and Michael Lipker (shot put, 6th, 44’7). News area leader Logan Olson was runner-up in the 400 meter dash in a time of 55.4. Cardinal sophomore Catherine Weeder matched her season high of 5’0 in winning the high jump at Central City, established a News area best in the triple jump with a second-place mark of 33’8 and placed second in the 800 meter run in 2:30.8. Schmitz lowered her season and area best time in the 1600 to 5:57.5, placing second. Boone Central/Newman Grove also got a runner-up finish by Olivia Slizoski in the 300 meter hurdles (49.3) and a second-place effort by the 4×400 relay team (4:21.6). 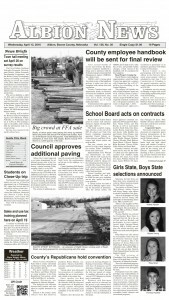 Boone Central/Newman Grove is scheduled to compete next in the G.I. Northwest Invitational, which has been moved to Friday due to forecasts of inclement weather Thursday (field events begin at 2 p.m.).